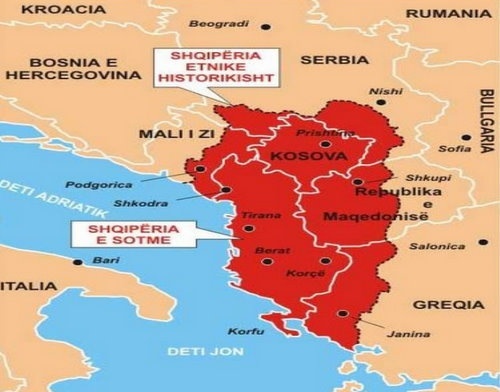 this is the map of the real Albania on how it used to be before 1913. "The delination of the newly established Principality of Albania under the terms of the London Conference of 1912-1913 (29 July 1913) and the Ambassadors of the six Great Powers of that time (Great Britain, France, Germany, Austria-Hungary, Russia and Italy) left Albanian and non-Albanian populations on both sides of the border." In other words and simple ones there are Ethnic Albanians in:Albania,Kosovo,Republic of Macedonia(Me),Montenegro,Greece,Serbia. Last edited by 2headedeagle; 07-09-2016 at 11:39.